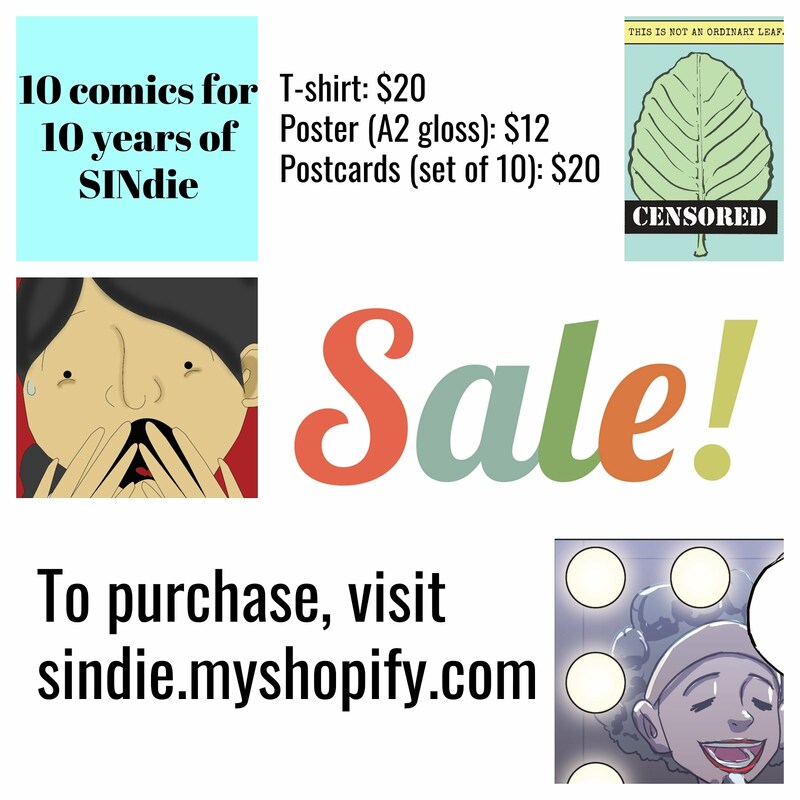 SINdie is proud to present the first-ever local film poster exhibition! 100 film posters from Singapore short and feature films will go up on display for the public from 28 Feb to 6 Mar at one of Singapore’s oldest arts establishments, The Substation. This is the first-ever extensive exhibition of Singapore film posters in Singapore and puts the spotlight on local films made in the last 5 years. 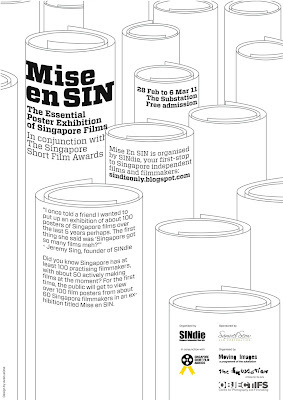 Titled Mise En SIN, a twist of the often-used cinematic term mise-en-scene, the exhibition will be held in conjunction with the Singapore Short Film Awards 2011, dovetailing with its aims to celebrate the resurgence of the filmmaking movement in Singapore observed in recent years. 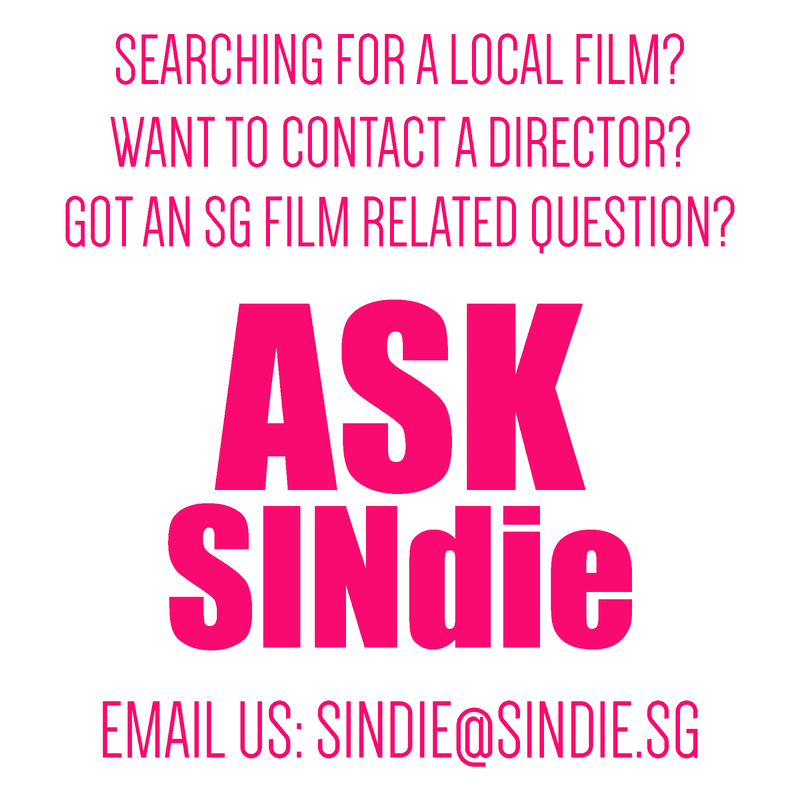 This exhibition is organised by SINdie, the only online site in Singapore fully dedicated to Singapore independent films and filmmakers. The Singapore Short Film Awards is co-organised by The Substation and Objectifs. 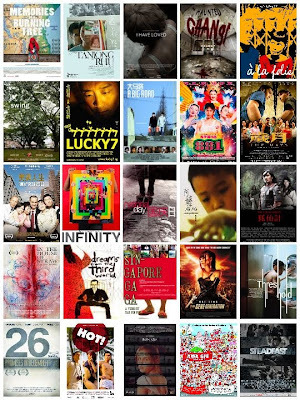 These 100 posters will feature works from the established to the up-and-coming, including some films screening at the Singapore Short Film Awards 2011. They come from over 60 Singapore filmmakers who have been contributing their posters over the last 2 months. The exhibition will be largely concentrated in the Random Room of the Substation with posters spilling out onto the foyer. Admission is free and visitors can take home their favourite posters at a contribution that goes back to the filmmakers. To add colour to the exhibition and screening, SINdie and The Substation have commissioned Mr Neo Chun Teck, Singapore’s last-surviving movie billboard artist, to paint a billboard for the week-long event. Visual artist Ming Wong, who won a Venice Biennale award for his work, Life of Imitation, had previously collaborated with Mr Neo. The buzz of this 100-poster exhibition will also be felt online with an online voting contest that will continue beyond the duration of the Singapore Short Film Awards. Lucky voters will stand to win attractive DVD prizes sponsored by Objectifs. Here are some snapshots from the Singapore Short Film Awards media conference yesterday where SINdie shared some highlights of Mise En SIN. Bee Pin from Wormwood Films apporached us and gave us the very unique name card. We loved it so much we decided to post it up! Read more about the Singapore Short Film Awards here. Finally, we want to say a big thank you to our main sponsor Samuel Seow law Corporation for sponsoring us and making this exhibition possible. Samuel Seow Law Corporation is a full-service law practice based in Singapore. Boasting one of the busiest Media & Entertainment practice groups in Singapore, the Corporation has been consistently ranked as one of the top law firms in its areas of expertise in the prestigious “Asia Pacific Legal 500”. Mr. Samuel Seow, Singapore’s “celebrity lawyer” and Managing Director of the corporation, has been ranked consistently as a “leading individual” in the same publication. Reflecting its corporate social responsibility, the corporation has also been awarded the National Arts Council’s Patron of the Arts Award for the past few years. Passion, dynamism and care sets apart the corporation’s lawyers and professionals who strive to recognise the uniqueness of each client and seek always to employ sound and cost-effective legal solutions to ensure relevance and most effective legal support. The corporation has expanded its reach to Malaysia in the last 2 years, and is presently associated with the Kuala Lumpur-based legal firm, Seow & Associates, which provides legal services to some of the most exciting media businesses there.